Epay Manager allows you to bill your customer from anywhere. It also gives you control over your cash flow, by allowing you to choose the date your money is deposited into your bank account. Our tutorials will show you how to get more out of Epay Manager. Having issues logging in to see your invoices and payments? We can help you reset your password via email. Epay Manager helps your customers pay you faster. Everything’s done online, so there is no paper or mail to deal with. The best part is, you get to decide the date you’re paid. It’s an online billing system, with fast-pay options, that your customers use to pay for the loads you haul. It’s normal to have questions about a new billing process. That’s why we provide online tutorials to help you. If you get an error message, or you don’t remember your username or password, we’ll help you reset it and log in. There are times when you simply need to be paid faster. With Epay, you can select your customer’s standard term or a fast pay option. You can do choose the date on each invoice you process. Once an option is selected, you’ll know the exact day your money will be deposited into your account. Schedule payments with Epay and you’ll have a complete record of your transaction dates, amounts, reference numbers and supporting documents. If your customer rejects or changes a payment, you’ll be notified immediately. Prior to payment, you’ll be alerted to every action your customer takes. With electronic billing there is no more mail, paper, or unnecessary delays. The entire billing process is online, so you can submit invoices and get paid from anywhere. With Epay, you have multiple fast-pay options to choose from on each invoice. If there’s a change in an invoice’s status or amount, an email will be sent to you notifying you of the change. Not sure what to do? These video tutorials will explain how every feature of the application works. Why is my customer asking me to use Epay Manager? Your customer cares about your cash flow. They use Epay Manager to offer you faster access to your money. 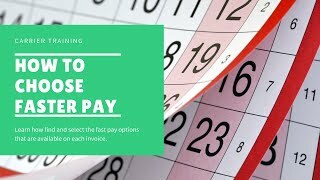 Epay Manager automatically creates your invoice shortly after delivery, and lets you choose the exact day the money will deposit in your bank account. Your customer understands that using electronic invoicing reduces the time you spend on billing. Lastly, eliminating mail and audits can speed up payment by 5-7 days, while reducing the time and cost of handling paper. We have an Epay account, but I don't remember registering? Many of our customers have integrated Epay's registration into their electronic carrier onboarding process, such as RMIS or My Carrier Packets. This is noted on the form, but can be overlooked. Automatically registering your company during this process saves you the time of having to manually register later. There are also instances where one user in a company may register on behalf of another. In these cases, you should NOT register again. Multiple registrations will delay payments and lead to unnecessary work for your staff. You may create as many additional users as you'd like. Your original admin user can create these accounts, and determine the permissions for new users. No problem, click this link to reset your password. Why does my invoice keep getting rejected? 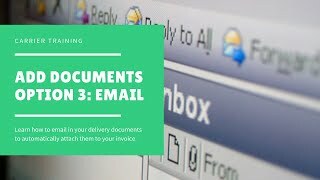 To receive payment, these documents must be uploaded to Epay Manager. You must login to your account, and navigate to your rejected transaction. Along with the Rejection Notice email, the Audit Log for your transaction will describe the exact reason your invoice was rejected and what you need to do to next. After you make the correction, you must Re-Send the Invoice to notify your customer that it's ready for additional review. 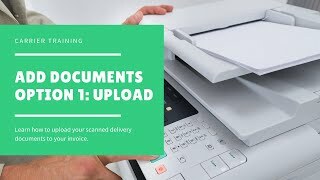 How do I submit my delivery documents? All delivery documents must be submitted to Epay Manager. Login to your account. Click on the Receivables menu header, then "Pending". Click the "I" Icon (or "X" if it's been rejected) and follow Step 1 in the blue box. 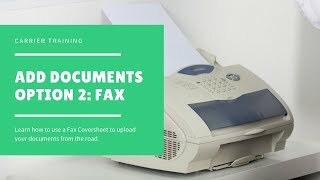 Using Epay, you can upload your documents, fax them with a custom coversheet, or email them from the system. Carriers or factoring companies with automation capabilities or high volume, may contact us for additional options. Do I have to take a discount on my payments? No. Every Epay Manager invoice contains a standard, non-discounted term that is provided by your customer. You will always have a non-discounted option available, along with any fast pay options that your customer chooses to offer. You have the power to choose the desired term on each invoice, and selecting a discount does not automatically apply to future invoices. The terms offered are generated exclusively by your customer, and Epay Manager has no influence over the options or discount rates. Your customer pays you directly. The funds are transferred from their bank account to your bank account on the selected payment date. Epay Manager is a software application that facilitates the transfer, and does not act as third party bank. How will I know when my money has been deposited? On the morning of the scheduled payment date, the funds will post to your bank account. Epay Manager will send you an email notification of a successful transfer. How do I reconcile my payments inside my accounting software? On the payment date, you'll receive an email notification of a successful deposit. Using your Receivables Paid list in Epay Manager as a guide, you may reconcile payments with your accounting software. 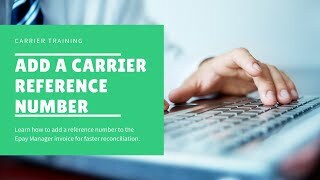 On each invoice, you have the option to enter a Carrier Reference Number. 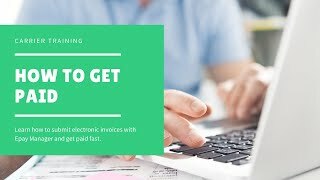 This number will help you connect the Epay Manager invoice with the record in your accounting system.